The theme of simultaneity runs through Hexsa’a̱m: To Be Here Always, an exhibition made by First Nations artists and community members, primarily Kwakwa̱̱ka̱̱’wakw (Kwak’wala-speaking peoples), and also others from across what are now called the Americas. The exhibition is housed at the Belkin Art Gallery on the campus of the University of British Columbia. The campus is on the historic grounds of the xʷməθkʷəy̓əm (Musqueam) people. A sign by the artist Edgar Heap of Birds reminds visitors of this on the approach from the parking lot. The apparent courteousness of the work might then be read as a deferral of addressing the underlying reality. But there is also the possibility that it is a subtle strategy to slip in the brutality of history through the cracks of settler reality. It is as if to set off a chain of thought: “This is a polite reminder that we stand on land that belongs to others. I suppose everything is OK; history has passed, and this is how it is now, and it’s good that we acknowledge that. But wait, why is British Columbia spelled backwards? What does that suggest? Is something changing, or turning, or reversing? Where will I be in this new order of things?” We who thought ourselves settlers have now become unsettled. It is this general feeling of an unsettling simultaneity that I find running through the show in the Belkin. If the desire of the settler’s mind is to be done with the past, to let it settle in a time that, while we wish it hadn’t happened, we are no longer accountable for, the insistent theme of the show is: this is now, this is always. But recrimination is only part of the story. 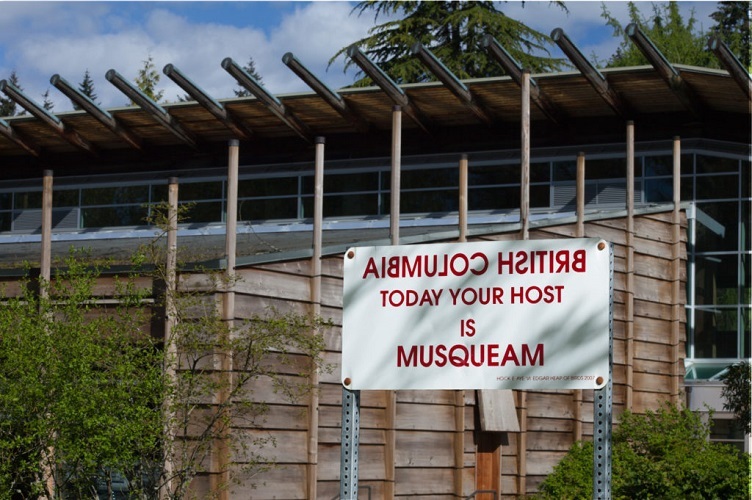 Your hosts are still Musqueam. And the host that welcomes is also the host that resists, survives, and perseveres. The greater part of the story in the exhibition insists: we are here now, we are here always. The simultaneity of occupation and resistance, of presence and absence, of past and present, is echoed in the various themes of the show. 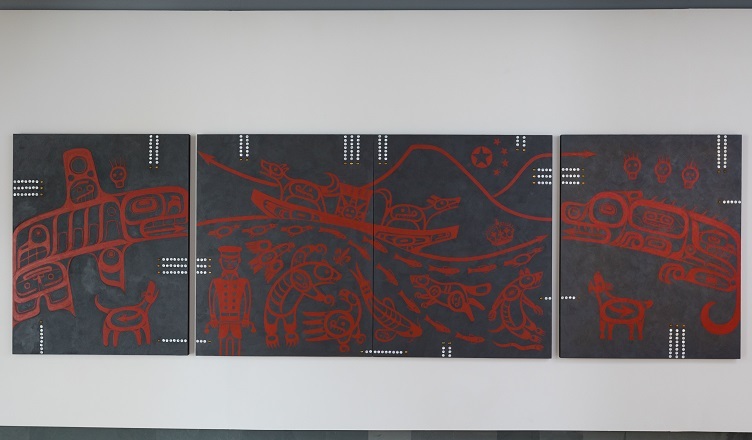 First, by bringing together artists from multiple First Nations, it challenges a claim to indigeneity as a monolithic category, showing overlapping diversities of experience, language, and expression. 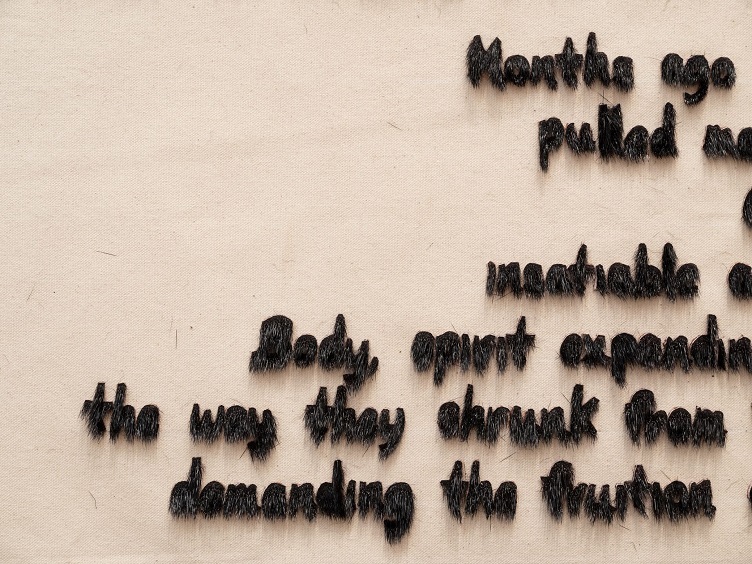 And by calling the exhibition “simultaneously research, material, media, testimony and ceremony” the organizer-artists also insist on the overlapping presence of what modern thought holds as commonly differentiated spheres.2 Indeed, the very genesis of the show was a simultaneity: it was conceived at the same time that the Dzawada̱’enux̱w First Nation brought a case against the British Columbia government to contest the state’s claims to Aboriginal waters. A large room of the exhibition is dedicated to a film made by Marianne Nicolson (‘Tayagila’ogwa) and Althea Thauberger alongside several activists and artists of the Dzawada’enuxw First Nation about their resistance. One final simultaneity of the show is the entanglement of languages. Hexsa’a̠m, beginning with its title and continuing across the works presented, dramatizes this condition through the multiplicity of languages used in parallel. The show here moves beyond the more common theme of translation. If translation is meant to take something from one semantic horizon and bring it into another, simultaneous language use foregrounds the overlapping histories that must learn to speak with each other if we are to create anything like a global community. The idea of the “here always” breaks with the colonial plan to deracinate local languages and impose English. And it thereby breaks with the colonial imaginary of the belatedness of indigenous peoples—famously dubbed the “denial of coevalness” by Johannes Fabian—not only by refusing the Eurocentric metrics of proper language, but also by refusing the idea that coevolution, transforming together, is impossible. The text shares a memory transmitted to the writer by her father. But while memory may be the world’s most trenchant sign of the simultaneity of past and present, its slippages and difficulties—reproduced formally in the hard-to-discern texture of the writing—register in the poet’s words: “sometimes we find the current / timeless and unbroken like these ancestral lines / but mostly we are swept by amassed brokenness and time.” To say that we are simultaneous, that we live in multiple languages and times and spaces, is never to say that the layers of the present are equal or properly jointed. They crack and shatter us, like the realities slipping through Heap of Birds’ seemingly docile signage. Allooloo’s poem ends, “I am finding / Being found.” The ambiguity of this phrasing forces another recognition of simultaneity between the object and its interpreter. Is her being found what initiates her own finding? And if so, is she the initiator of something new: the founder of what it would mean to be found? And is this her act alone, or something that is refounded every time someone learns this process of mutual recognition between the finder and the found? Or perhaps the meaning is more insidious, given the history of the “founding” of the colonies, the “finding” of the Northwest by explorers who did not, in fact, know where they were. Then perhaps there is something unspoken between these words: I am finding [that] being found [is a wretched experience]. These ambiguities constitute the simultaneities we live with and that Hexsa’a̱m: To Be Here Always makes both subtly and explicitly apparent. They mark the overlaps of a world founded in violence, but always still finding the paths to a new founding, in and after the deluge. William Smith, “In the Studio: Hock E Aye Vi Edgar Heap of Birds,” Art in America (blog), accessed February 8, 2019, https://www.artinamericamagazine.com/news-features/magazines/in-the-studio-hock-e-aye-vi-edgar-heap-of-birds/. Press Release, “Hexsa’a̠m: To Be Here Always,” accessed February 8, 2019, https://belkin.ubc.ca/_email/_main_belkin/20181210-Hexsaam/. Avram Alpert is a Lecturer in the Princeton Writing Program. 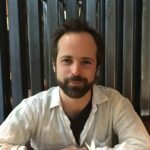 He was previously a Fulbright Scholar in Brazil and a postdoc at the Center for Cultural Analysis at Rutgers University. In 2001, he first attempted organizing--a student union in high school--but was outmaneuvered by the principal and the union failed. He's been trying to understand the relation between culture, power, and institutions ever since.